New York City mayor Bloomberg recently compared Hudson Yard development to the Canary Wharf district of London. Canary Wharf is one of London’s main business district located along the West India Docks, which was the busiest port in the world in 1930’s. In 1980 due to the decline of the local port industry, the Docks closed. In the mid 1980’s, Canary Wharf experienced a second birth when a government program backed the initiative from former Credit Suisse chairman Michael Von Clemm to redevelop the Docks into a commercial area to relocate the back offices. Now, Canary Wharf is home of the European headquarters of the world’s largest financial and banking institutions sharing over 14 million square feet of retail and class A office space majorly owned and developed by Canary Wharf Group (56%). 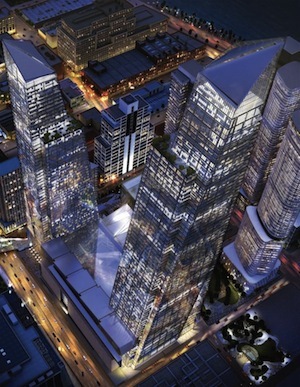 So, how could Hudson Yard area and projects experience a similar success and growth? At a glance, the Hudson Yard offers an ambitious and attractive development scheme covering the area of W 43rd and 9th Avenue to W 28th Street and Hudson Yard Park with a rezoning allowing for construction of 24 million square feet of new office space, over 13 thousand of new housing units (one third being affordable units), 1 million of new retail space, and 2 million square feet of new hotels which include a new headquarters hotel for the Javits Convention Center. Similarly to the development of Canary Wharf, Hudson Yard expansion project has a leading developer – the Related Companies – which is planning for 12 million square feet of mixed-use real estate development, along the east and west side of the MTA 7 line extension. The area also featured a Heliport on West 30th Street, which is a great feature for executives landing at any of the 3 main airports and fancying a helicopter ride to avoid traffic and get to their meetings without stress. While the financial institutions were the main occupants of Canary Wharf, the Hudson Yard may attract a wider scope of firms including fashion, media and tech firms. Recently Coach, a leading American designer and manufacturer of luxury handbags and accessories, decided to purchase (and not rent) 600,000 square feet of office space or half the surface of the first tower (opening 2015), which can be seen as a strong statement about the economic growth potential of the area. Also, Ebay rented 35,000sq ft at 625 6th Avenue, LivingSocial (local competitor of Groupon) renewed his lease of an entire floor at 101 5th Avenue, and Google donated to Cornell University and Technion-Israel Institute of Technology 22,000 square feet of temporary office space to be used while their Roosevelt Island Tech campus is being built. Hedge funds and private equity companies may start showing interest after the US Presidential Elections and signs stability of the Euro zone, which should make capital raising easier; and therefore, stimulate financial and business activities. With an expected date of completion in 2015 and 2017 for the first 2 towers of the Hudson Yard Project, developers are benefiting from a comfortable 2 to 5 years window to secure future tenancy in one of the trendiest and attractive neighborhood of Manhattan. Indeed, the economic outlook of Midtown South is showing positive signs of growth. 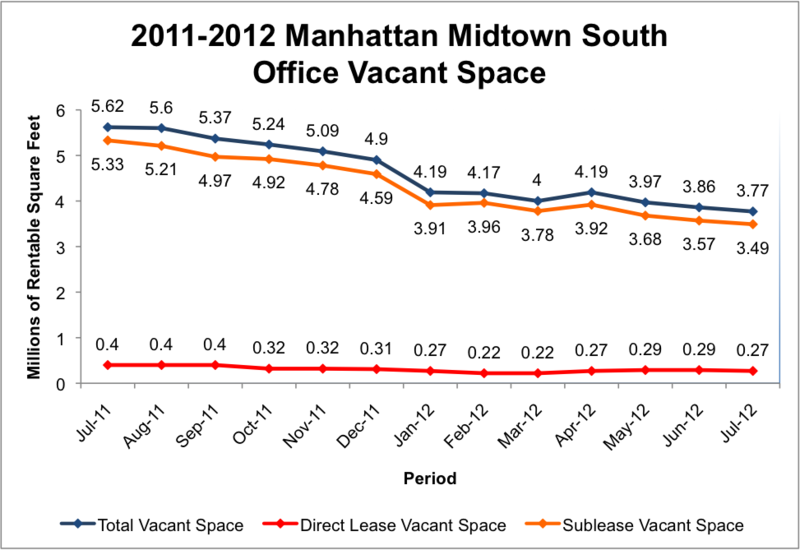 First, Midtown South has represented 73% of the positive office space absorption in Manhattan during the first 4 months of 2012. Second, recent numbers showing a decreasing vacancy rate (see graph) has made Midtown South the least vacant central business district in the country (5.9% vacancy rate). Finally, the rent increase for office space in Midtown South (+ 11% year to year) that has been fed by tech and media companies moving into office spaces in this area. With the Hudson Yard development, New York City is burgeoning one of the future most desirable business district in the US and the World, contributing again to the evolution of the city commercial landscape.